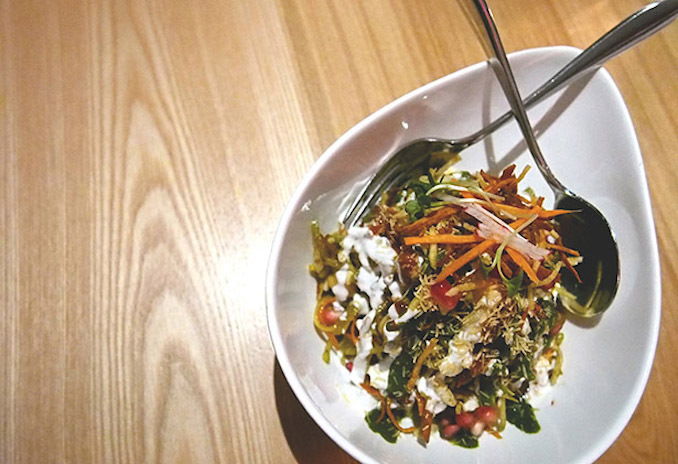 Last February, I had the opportunity to go and visit newly opened restaurant Pukka (778 St. Clair Avenue West) with its owners Derek Valleau and Harsh Chawla (both formerly of Amaya The Indian Room). The space (upon entrance) hasn’t changed much but what Harsh and Derek have done with Pukka in the last year has been incredible. They have created a fine-dining Indian food experience from the moment you enter the restaurant to the moment you leave with carefully thought out dishes and cocktails. The space is fresh and modern with soft mood lighting. The staff are friendly, accommodating and can explain every item to you on the menu without the bat of an eyelash. From the moment we arrive until the moment we leave, the restaurant is filled with a frenetic energy where every single seat and table is filled. Harsh and Derek seem to know everyone in the room or at least, they have made everyone so comfortable that it seems like they do! So what is new? Well, Harsh tell us they have been focusing a lot of energy into their cocktail menu and trying to take classics while putting a bit of an Indian twist on it. Take for example, the British Raj ($10.20) with Gosling’s rum, lime, almond syrup and pineapple juice or the Rose G&T ($9.20) which contains rosewater, cucumber, peppercorn syrup and tonic. Another honourable mention goes out to the Mumbai Sour ($10.40), with gin, aperol, grapefruit, cardamom bitters and egg whites. 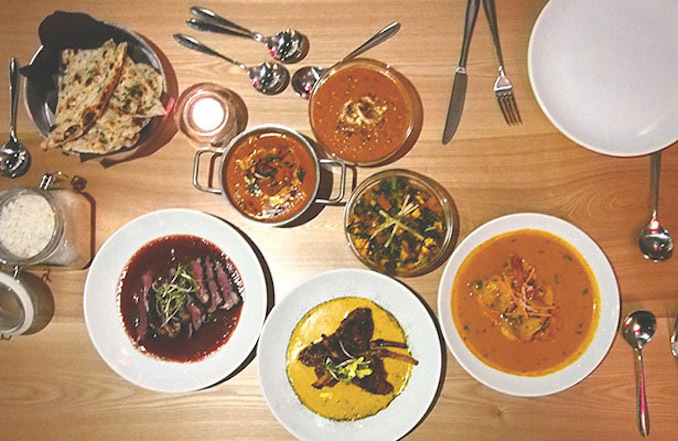 The kitchen at Pukka is adorned with a clay tandoor oven and the menu is chalked full of seasonal, locally sourced ingredients while using rich spices and creams to take on their house-made curries and rubs. While many of the dishes were still around from my first visit, there were many new dishes that have taken up new homes on the menu. 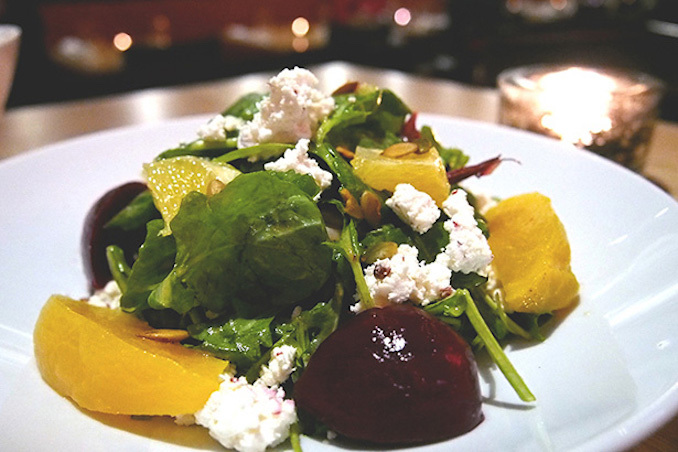 For starters, we have the Beets and Paneer ($11.70) made up of greens with pickled beets, toasted spiced pumpkin seeds with crumbled paneer cheese in a chilli-orange vinaigrette. 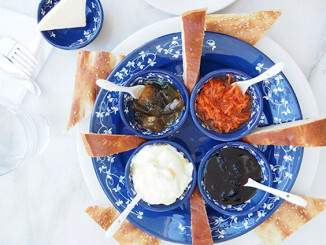 The dish is simple and so well done as all the ingredients speak for themselves. 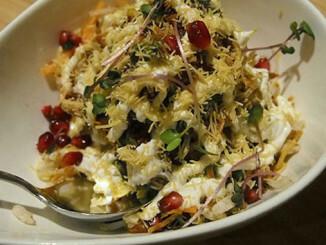 ogether with sprouts, rice crisps, pomegranate, mango in with chutney and yogurt – it created a nice balanced dish with crunch and sweetness. For our main dishes, Harsh explained to us that while they have spent a lot of time perfecting what they currently do have on the menu – they have taken the time to introduce some new items which have been warmly received by all. 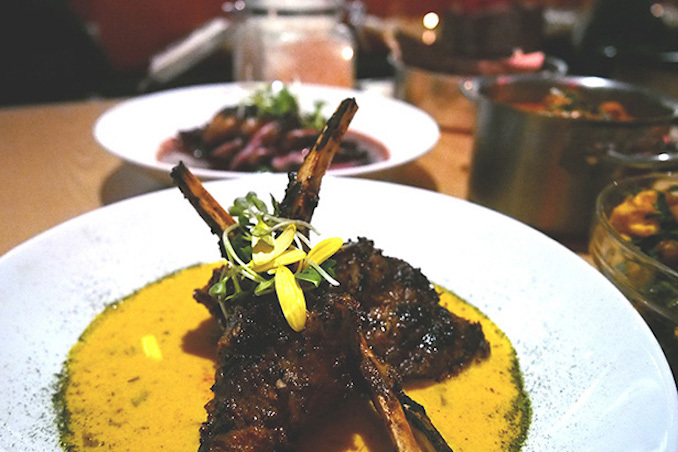 One such item has been the Lamb Lollipops ($26.70) served in a coriander curry sauce and rubbed in turmeric and mint. The lamb is juicy, tender and prepared with absolute care. The curry adds a wonderful kick to an already wonderful dish. Some other standout dishes from the evening which were new additions were Seared Spice Duck Breast ($23.60, bottom left dish in photo below). The duck was melt in your mouth with the savoury flavours of tamarind and lime shining through. The dish was perfectly prepared. Next up, the Boatman Fish and Prawn Curry ($26.80, bottom right dish in photo below) was flakey, tender and and the coconut broth I could eat on its own. Finally, the Daal makhani ($10.80, top dish in photo below) which is a creamy black lentil dish was out of this world. Once again, simple but well done. When I’ve been asked what the best Indian in the city is, I’ve always said: Pukka, hands-down. They are doing inventive things in the kitchen and behind the bar while preparing and sending out amazing food. You won’t be disappointed if you attend, so check it out.